The Portuguese Competition Act,2 which has been in force since 2012, modified the legal standards for the handling of complaints by the Portuguese Competition Authority (PCA), giving the PCA greater discretion to decide when to open an investigation based on certain criteria. According to the Competition Act, the PCA will exercise its sanctioning powers whenever it is in the public interest to prosecute and punish an infringement of competition rules, taking into account the goals of its competition policy, the facts that are known to it, the severity of the alleged infringement, the probability of proving its existence and the scope of the investigation that is required. promoting the consolidation of a competition culture in Portugal. These strategic priorities are organised around three main ideas: the need for the PCA’s active and effective role in the defence of competition; the need to foster a sense of transparency and rigour; and the need to promote effective competition in the market. The PCA’s statement of objections for 2018 indicates that the PCA will continue to focus on combating cartels and to promote ex officio investigations as an essential instrument to identify possible anticompetitive practices. In fact, according to its statement of priorities, in 2018 the PCA will decide a high number of investigations regarding antitrust proceedings that were initiated during 2017. Moreover, the PCA intends to make full use of all the available tools for evidence collection, and in this context is planning on reinforcing its investigative capacity in the digital environment and in the context of the digital economy. Additionally, the PCA mentions that it will also focus on delivering more legally and economically robust decisions, with sanctioning levels aimed at deterrence (either general or specific). The PCA has also set as one of its priorities for 2018 the promotion and consolidation of a competition culture in Portugal. It intends to foster the perception that competition between undertakings is beneficial to citizens in general, and therefore should be seen not only as a public good but as a right: the right to competition. Moreover, it plans to emphasise the positive correlation between competition, innovation, productivity and competitiveness. Finally, it must be noted that 2018 marks 15 years since the creation of the PCA. A closer look at its strategic priorities demonstrates that, although the PCA is fostering the continuity and consolidation of its activities in previous years, it is also embracing the new challenges and trends facing competition policy. The PCA is an independent entity responsible for the enforcement of competition law in Portugal and for conducting administrative infringement procedures under the Competition Act. The PCA’s decisions may be appealed to the Competition, Regulation and Supervision Court (appeals were previously heard by the Commercial Court of Lisbon). In Portugal, cartels are administrative (not criminal) offences sanctioned with fines not exceeding 10 per cent of the offending undertaking’s turnover in the year preceding the decision. According to general rules subsidiarily applicable to administrative offences, when there is more than one infringement, the maximum fine may be twice the abstract maximum applicable to the most serious offence, which in a cartel would be 20 per cent of the turnover of the offending undertakings.5 Fines imposed to date in cartel cases have generally amounted to around 5 per cent of the infringing undertaking’s turnover. The members of the board of directors of the offending undertakings, as well as any individuals responsible for the management or supervision of the areas of activity in which there have been an administrative offence, when they know of, or it is their duty to know of, an infringement committed and they have not adopted appropriate measures to end the infringement immediately, are liable to be sanctioned under the Competition Act, unless they are subject to a more serious sanction under a different legal provision. The fine imposed on individuals cannot exceed 10 per cent of the individual’s annual income deriving from the exercise of their functions in the undertaking concerned. As an ancillary sanction under Article 71 of the Competition Act, a ban of up to two years on the right to take part in tendering processes for public works contracts, public service concessions, the leasing or acquisition of movable assets, or the acquisition of services or procedures involving the award of licences or authorisations by public entities, may be imposed. The ban may be imposed in cases in which the practice leading to an administrative offence punishable by a fine occurred during or as a result of those processes. Article 29 of the Competition Act establishes that the PCA may also impose behavioural or structural measures to end the prohibited practices or their effects. Under the Competition Act, and as regulated by the PCA, undertakings or individuals connected to the cartel may apply for immunity or a reduction of a fine if they provide information about the cartel. The PCA also sanctioned a cartel involving undertakings operating in the printing and graphics sector. Several undertakings were fined for a price-fixing and market-sharing agreement concerning the market for application form paper after an investigation triggered by a leniency application. The fines totalled €1.798 million. In addition, three board members were fined €6,000 for being aware of the cartel and failing to take action to put an end to it. Although not related to cartel cases, there have been a number of cases involving recommendations and decisions issued by trade associations. In some cases, the infringements are similar to standard antitrust cases (e.g., price fixing). In most cases involving trade associations, the investigated behaviour nevertheless related to recommended practices, as well as maximum prices, which were understood by the undertakings to be mandatory. Under the previous legal framework in Portugal, antitrust decisions were not generally published on the PCA’s website, and current access to antitrust decisions is still very limited in cases with pending judicial appeals. As such, the public’s knowledge of antitrust issues is limited, to a great extent, to the press releases published by the PCA. Notwithstanding, the PCA is attempting to become more transparent, and recently the issuance of statements of objections and information regarding the carrying out of unannounced inspections has been publicised through press releases. In its priorities for 2018, the PCA has expressly stated that it will continue to ensure the wide publication of its decisions, as well as the subsequent court decisions, in order to promote its accountability and credibility among the stakeholders. According to publicly available information, the sanctioning of antitrust conduct in Portugal has occurred more frequently with regard to restrictive practices within trade and professional associations, including price fixing, and to bid-rigging cartels. In 2016, the PCA published an antitrust compliance guide for trade associations aimed at better elucidating the associations and its members on which behaviours or decisions could present competition risks and should therefore be avoided. The PCA has resorted to the leniency programme with increasing frequency, and has specifically mentioned in its strategic priorities that it intends to further promote the programme in 2018. Individual sanctions have also been imposed. In addition, the settlement mechanism established in the Competition Act has proven to be a very useful instrument for the PCA to investigate and prove cartel cases, as well as other antitrust infringements. Moreover, the PCA will seek to continuously improve its internal investigative procedures to make full use of the most appropriate tools for evidence collection and treatment, namely in a digital environment. In its 2018 priorities, the PCA has specifically mentioned that it will reinforce its investigative capacity in the context of the digital economy, being particularly vigilant regarding situations where technology may facilitate or enable anticompetitive behaviour or cartelisation. The PCA has confirmed that it will pay close attention to the eventual use of algorithms and artificial intelligence so that these cannot be a way of exempting responsibility. The PCA will continue to promote its leniency policy as an essential instrument for cartel identification, particularly through the imposition of dissuasive fines, in order to stress the advantages of such a regime. The PCA will also engage more closely with relevant stakeholders with the intention of promoting the leniency programme within the business and legal communities. Additionally, the PCA will continue to improve its online whistle-blowing system to ensure secure communication with anonymous whistle-blowers. refusing another undertaking access to a network or other essential facilities that it controls, when appropriate payment for access is offered, in a situation where the other undertaking cannot, therefore, in fact or in law, act as a competitor of the undertaking in a dominant position in the market, upstream or downstream, unless the dominant undertaking can demonstrate that, for operational or other reasons, such access cannot reasonably be provided. The Portuguese legal framework on restrictive practices and the abuse of dominant positions is very similar to that applied at the EU level; however, the Competition Act also includes provisions on the abuse of a situation of economic dependence.31 An abuse of a situation of economic dependence may include any of the types of conduct previously mentioned and identified as potentially abusive under the abuse of dominance rules, as well as the full or partial rupture of an established commercial relationship, in view of past commercial relations, trade practices in the relevant market and contractual conditions. The major cases regarding abuse of a dominant position involved Portugal Telecom (PT), the former telecommunications incumbent. PT was sanctioned for discriminatory pricing for allegedly offering more favourable prices, through special discounts, to operators from its group compared to competing retailers. It was also sanctioned for alleged margin-squeezing practices and for an alleged refusal to grant access to its underground conduit network, which the PCA considered to be an essential facility.32 The most significant sanction imposed amounted to approximately €53 million, although the appellate court considered the infringement to be time-barred. The PCA has also sanctioned a professional association for abuse of a dominant position: in 2010, the Portuguese Chartered Accountants Association was fined for alleged restrictions imposed in the market for the training of certified accountants. The PCA has established as one of its priorities for 2018 the detection and investigation of anticompetitive practices. Moreover, it is expected to continue its efforts to promote access to its decisions and the decisions of the courts of appeal, and to disseminate accurate and complete information on the competition rules. Moreover, as previously mentioned, the PCA’s online whistle-blowing system will be renewed, enabling a more efficient screening of complaints. Additionally, the PCA will continue to promote the adoption of commitments whenever important procedural gains can be anticipated. The Competition Act applies to all areas of the economy, including regulated sectors. The PCA has been monitoring several sectors in recent years, and the PCA’s supervisory powers have been strengthened. The most significant cases involving undertakings operating in regulated sectors were the three abuse of dominance cases brought against PT (discussed above). The existence of regulations in the telecommunications sector did not impede the application of the competition rules. The PCA will continue to conduct market studies and surveys in various sectors of the economy to better identify possible anticompetitive conduct. As previously mentioned, the PCA will focus primarily on controlling possible concerted practices in public procurement. According to its priorities for 2018, the PCA will focus on the following sectors: banking, insurance and financial markets, telecommunications and media, energy and fuels, health and pharmaceutical industry, education, food and distribution, environment and resource management, liberal professions, transport and infrastructure, as well as construction. As indicated above, the PCA’s supervisory powers have been strengthened by the Competition Act and include, apart from requiring information from undertakings or associations, the possibility of carrying out inspections and audits. These inspections and audits have proven to contribute to the detection of inefficiencies by the PCA in some markets and sectors, and will increasingly do so. Additionally, as previously mentioned, the PCA has set as one of its priorities for 2018 the implementation of mechanisms for an impact assessment of public policies with regard to competition policy, intending to work closely with the relevant public entities. Article 65 of the Competition Act establishes that aid provided by the state or any other public body may not restrict, distort or appreciably affect competition in all or a substantial part of Portugal. The PCA may issue recommendations on any public assistance provided and monitor the implementation of those recommendations, for which purpose it may request information from any party. The recommendations are published on the PCA’s website. One of the most important rulings on state aid involving Portugal was the European Court of Justice (ECJ) ruling on appeal in the Azores case.60 The ECJ ruled on the application of territorial selectivity criteria in cases involving autonomous regions (such as the Azores region), and set the necessary conditions to be met for an autonomous region to be considered as the benchmark as opposed to the national territory as a whole. The banking sector in Portugal has been particularly subject in the past few years to state aid procedures. Further to the above-mentioned resolution cases, in should be mentioned that the capitalisation programmes for Portuguese banks66 and the creation of the Portuguese Finance Development Institution67 have followed the applicable state aid rules as established in cooperation with the European Commission. Apart from the financial sector, which may continue to be monitored, regional aid is going to be particularly relevant in the next few years. In 2014, the European Commission approved, under the EU state aid rules, Portugal’s state aid plan for 2014 to 2020. These guidelines set out the conditions under which Member States can grant state aid to businesses for regional development purposes, and are expected to foster growth and greater cohesion in the single market. The PCA has exclusive jurisdiction to enforce the merger control rules established in the Competition Act. Only concentrations, as defined in Article 36 of the Competition Act, which meet one of the notification thresholds established in Article 37(1), are subject to merger control review. The basis of the concept of concentration lies in the notion of change of control on a lasting basis, and the definition of ‘control’ adopted in Article 36(3) of the Competition Act is similar to that used in the European Merger Control Regulation (i.e., the possibility of exercising decisive influence on an undertaking). The Competition Act, unlike the EU Merger Regulation and the laws of most Member States (except for Spain), establishes alternative turnover and market share notification thresholds, even though a de minimis rule was introduced in 2012.
the concentration results in the acquisition, creation or increase of a market share in Portugal equal to or greater than 30 per cent and less than 50 per cent, provided that the individual turnover in Portugal of at least two of the undertakings concerned exceeds €5 million. The time limit for the PCA to issue a decision is 30 business days for normal Phase I proceedings and 90 business days as from the initial notification for cases requiring in-depth investigations. These time limits can be suspended if additional information is requested from the parties and, in general, at the parties’ request or if commitments are offered, or if the parties are invited to comment on the PCA’s draft decision. Since the enactment of the Competition Act currently in force, and similarly to the EU Merger Regulation provisions, the parties no longer have a specific deadline to notify (unlike previously, where parties had seven business days to do so). The parties nevertheless are obliged to suspend the implementation of the concentration until the PCA has issued a clearance decision. Breach of this obligation entails a fine of no more than 10 per cent of the turnover of the undertaking in breach. Pursuant to the Competition Act, any act or transaction implementing the concentration prior to clearance from the PCA is unenforceable. The most important exception to the referred standstill obligation is the possibility to implement public takeover bids, provided that, in general, the acquirer does not exercise the voting rights in the target entity until clearance is obtained. The Competition Act now adopts the significant impediment of effective competition test to assess concentrations instead of the dominance test that was previously used. Merger control decisions are subject to judicial appeal and to a special administrative appeal if the merger is blocked (although such an appeal would only be upheld if the benefits to the national economy outweigh the disadvantages to competition resulting from the prohibited merger). The simplified filing form and pre-notification contacts have been increasingly used, enabling a swifter assessment and earlier decisions regarding uncomplicated matters.82 The PCA is expected to continue to promote the use of the simplified filing form, as well as pre-notification contacts, to deliver swifter decisions and enhance transparency in the market. The PCA has stated that one of its priorities for 2018 is the implementation of more efficient and quicker merger control proceedings. Moreover, the PCA has also mentioned that it will be particularly alert to gun-jumping cases. The PCA continues to actively pursue the goal of protecting and promoting competition in the Portuguese economy. It is becoming more dynamic, has been investing in its technical capacity and is determined to contribute to a sound culture of competition policy in Portugal. The PCA’s focus continues to be combating cartels and anticompetitive practices, being particularly vigilant in the context of the digital economy. Notwithstanding this focus, the PCA will also closely monitor recent mergers in order to detect eventual gun-jumping cases. Additionally, in 2018 the PCA is expected to promote advocacy activities in order to enhance the transparency of its actions and raise awareness of the advantages of effective competition for the Portuguese economy. 1 Joaquim Caimoto Duarte is a counsel, Tânia Luísa Faria is a managing associate and Maria Francisca Couto is a junior associate at Uría Menéndez – Proença de Carvalho. 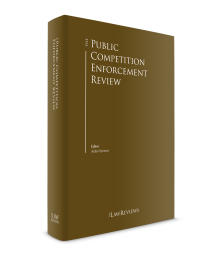 2 The Portuguese Competition Act, Law 19/2012. 4 See Article 75 of the Competition Act, as well as the PCA’s Informative Communication on the Portuguese leniency programme, available at www.concorrencia.pt/vPT/Noticias_Eventos/Comunicados/Documents/DR_NOTA%20INFORMATIVA_CLEMENCIA_PosPublReguDR_03_01-2013.pdf. 5 As stated in the PCA’s Guidelines on the calculation of fines, available at www.concorrencia.pt/vPT/Noticias_Eventos/Comunicados/Documents/Linhas_de_Orientação_Coimas_DEZ2012.pdf. 6 In other antitrust infringements not connected to cartels, the PCA may decide to close an administrative procedure if it receives what it considers to be adequate remedy proposals from the undertakings. In that case, there will be no infringement under the Competition Act, but the undertakings must implement the remedies agreed with the PCA. The PCA may decide to reopen the procedure under certain circumstances within the next two years. 7 PCA press release of 11 January 2005. 8 PCA press release of 17 July 2006. 9 PCA press release of 8 July 2009. 10 PCA press release of 30 December 2009. 11 PCA press release of 12 September 2013 (19/2013). 12 PCA press release of 14 October 2014 (14/2014). 13 PCA press release of 17 January 2008. 14 PCA press release of 12 September 2013 (19/2013). 15 PCA press release of 10 August 2015 (18/2015). 18 PCA press release of 29 January 2009. 19 PCA press release of 19 January 2011. 20 PCA press release of 28 September 2017 (14/2017). 21 PCA press releases of 28 June 2005 and of 12 July 2005 and press release 14/2006. 22 PCA press release of 14 September 2016 (18/2016). 23 PCA press release of 15 November 2016 (23/2016). 24 PCA press release of 24 June 2012. 26 PCA press release of 15 November 2017 (20/2017). 27 Article 19 of the Competition Act. 28 PCA press release of 17 January 2017 (01/2017). 29 PCA press release of 8 July 2017 (09/2017). 30 PCA press release of 25 July 2017 (11/2017). 31 An undertaking is considered to be in a situation of economic dependence with regard to another undertaking if it does not have an equivalent alternative to contracting with that undertaking (i.e., when the good or service at issue is provided by a limited number of undertakings and the undertaking would be unable to obtain identical conditions from other commercial partners within a reasonable period). 32 PCA press releases of 1 September 2008, of 2 September 2009 and of 2 August 2007. 33 PCA press release of 15 October 2009. 34 PCA press release of 20 June 2013. 35 PCA press release of 31 December 2015 (31/2015) and of 20 October 2016 (20/2016). 36 PCA press release 2 October 2007. 37 PCA press release of 19 July 2012. 38 PCA press release of 3 February 2015 (01/2015). 39 PCA press release of 4 January 2016 (01/2016) and of 19 January 2017 (02/2017). 40 PCA press release 2 August 2007. 41 PCA press release 22 August 2016 (17/2016). 42 PCA press release 28 December 2017 (23/2017). 43 PCA press release of 22 June 2015 (12/2015). 44 PCA press release of 16 July 2015 (15/2015). 45 PCA press release of 21 September 2015 (21/2015). 46 PCA press release of 16 December 2015 (29/2015), of 19 October 2016 (19/2016) and of 13 October 2017 (15/2017). 47 PCA press releases of 30 December 2015 (17/2014) and of 23 March 2015 (07/2015). 48 PCA press release of 27 July 2015 (16/2015). 49 PCA press release of 2 December 2015 (28/2015). 50 PCA press releases of 18 September 2015 (20/2015) and of 23 February 2016 (05/2016). 51 PCA press release of 22 March 2016 (07/2016). 52 PCA press release of 21 June 2016 (14/2016). 53 PCA press release of 4 August 2016 (16/2016) and of 5 May 2017 (05/2017). 54 PCA press release of 14 November 2017 (19/2017) and 21 December 2017 (21/2017). 56 PCA press release of 13 July 2015 (13/2015). 57 PCA press release of 20 July 2016 (15/2016). 58 PCA press release of 30 March 2017 (03/2017) and of 25 October 2017 (17/2017). 59 See the presentation of the chair of the PCA’s board, available at www.concorrencia.pt/vPT/Noticias_Eventos/Intervencoes_publicas/Documents/VFapresentação%20COFAP%2018%20fev%202015_VF.pdf. 60 Case C-88/03 Portugal v. Commission. 72 Case 37/2004 – Barraqueiro/Arriva, Case 45/2004 – Petrogal/Esso; Case 22/2005 – VIA Oeste (Brisa)/Auto-Estradas do Oeste/Auto-Estradas do Atlântico, Case 12/2009 – TAP/SPdH; Case 41/2009 – Ongoing/Prisa/Media Capital and Case 4/2013 – Controlinveste*Zon Optimus*PT/Sport TV*Sportinveste*PPTV. 73 Case 22/2005 – VIA Oeste (Brisa)/Auto-Estradas do Oeste/Auto-Estradas do Atlântico. 74 Case 41/2009 – Ongoing/Prisa/Media Capital. 75 Case 57/2006 – TAP/PGA. 76 Case 9/2015 – EDP Renewables/Ativos ENEOP and Case 55/2015 – EDP Renewables/Sociedades Ventinveste. 77 Case 49/2010 – TRPN/Internorte. 78 Case 16/2011– Powervia/Laso*Auto-Laso*Probilog*Laso Ab. 79 Case 38/2012 – Arena Atlântida/Pavilhão Atlântico*Atlântico. 80 PCA press release of 9 January 2013. 81 PCA press release of 27 December 2017 (22/2017). 82 See the PCA press presentation available at www.concorrencia.pt/vPT/Noticias_Eventos/Intervencoes_publicas/Documents/apresentação%20COFAP%2018%20fev%202015_v3.pdf. 84 Press release available at www.concorrencia.pt/vPT/Noticias_Eventos/Comunicados/Paginas/Comunicado_AdC_201502.aspx?lst=1&Cat=2015. 85 Court decision available at www.concorrencia.pt/vPT/Praticas_Proibidas/Decisoes_Judiciais/contraordenacionais/Documents/AAE_1_13_TCRS1jul2015.pdf. 86 Press release available at www.concorrencia.pt/vPT/Noticias_Eventos/Comunicados/Paginas/Comunicado_AdC_201527.aspx?lst=1&Cat=2015.